This section provides information about editing the RTW RMDS (SFC) engine configuration options using the RTW rtconfig Editor. The options are located under the RMDS (SFC) Tab of the Rtconfig Editor dialog, and correspond to those found in the rtconfig file located in the installation directory. To manually edit the RTW RMDS (SFC) engine configuration options in the rtconfig file, see Manually Editing the rtconfig File. To edit the generic RTW configuration options as well as some general engine settings, see Generic Tab - Rtconfig Editor. To edit the RTW RMDS (SFC) rtconfig settings, select Vistasource → Settings → Rtconfig Editor and then select the RMDS (SFC) tab. Refers to the rtconfig file option “rmds_Implementation”, which specifies the default implementation the SFC API will use to connect to your infrastructure. It is part of the default transport (connection), which is specified by Implementation, Services, and the appropriate SFC configuration parameters. SSL, if your infrastructure is Triarch or RMDS (P2PS). TIB, if your infrastructure is TIC/SASS2, TIC/SASS3, or RMDS (RTIC). The default is TIB. To use both TIB and SSL infrastructures, additional connections can be specified. See section Connections below for more information. Refers to the rtconfig file option “rmds_Services”, and is used to specify a list of services to display in the RMDS (SFC) dialog boxes for subscribing. This comma-separated list refers to the services in the default transport (Connection). The service list will vary depending on your setup. By default, this option is not set. If TIC/SASS3 or RTIC has been configured to not dynamically discover services (see section SFC Configuration below), you must list your services here to add them manually. Refers to the rtconfig file option “rmds_Config”, which is use to set the location of the SFC configuration file. Vistasource provides a sample sfcapi.conf in the installation directory. This file contains various settings for the RMDS SSL and TIB infrastructures. Depending on your specific configuration, you may need to merge this sfcapi.conf file with an already existing file on your system. If the file is not found in the local directory, \HKEY_LOCAL_MACHINE\Software\Reuters\SSL\SSLAPI_CONFIG registry entry. If no sslapi.cnf file exists, the ipcroute file will be located per SSL 4.0 guidelines. NOTE: Since the SFC Configuration file takes priority over the legacy ipcroute file, Reuters recommends using the ipcroute parameter instead of the ipcroute file to avoid confusion. To edit the selected file, click on the Edit button. We strongly recommend that you consult the SFC manuals for more information regarding the Reuters file sfcapi.conf. The configuration file that Thomson Reuters provides may be called sslapi.cnf. When using the Vistasource sample sfcapi.conf file found in the install directory, you may need to make specific edits depending on your specific setup. Refers to the rtconfig file option “rmds_KeepStaleData”. When this option is checked on, RTD cells will retain their values even though the RTW RMDS (SFC) engine has been notified that they are no longer valid (that is, they have become stale). The “data stale” message will still be displayed in the status window. When this option is off (the default), cells referring to stale data will display N/A. Refers to the rtconfig file option “rmds_UseFourPartSubjects”. When using a TIB implementation, the default behavior for subscribe is to accept 2-part subject names, for example: MSFT.O (the SFC API automatically maps RICs into 4-part Rendezvous subject names using an internal mapping algorithm). Select this option, if you want to use 4-part subject names (and do not want to rely on the API's algorithm). When publishing market data (as opposed to contributing), the record name must be a four-part subject name regardless of the setting of this option. Refers to the rtconfig file option “rmds_logger”, which turns on the SFC API logging mechanism. Select this option if you want the API to log according to the logging settings in the sfcapi.conf file. By default, this option is turned off. For more information on the SFC API logging, see SFC Configuration below. The fields in this panel refer to the section in the rtconfig file used to set up multiple connections (rmds_transport settings). For instance, when working in an infrastructure that supports both RMDS SSL and TIB, two connections have to be created, one for each implementation. The creation order is irrelevant. See also the example Simple RMDS (SFC) Installation for both SSL and TIB under SFC Setup Examples. Enter a new name for the new connection, e.g. conn1. Enter a new name for the new connection, e.g. conn2. Enter the Rendezvous Service, e.g. 7500. Enter the Rendezvous daemon e.g. tcp:10.100.1.92:7500. Enter the services using a comma-separated list. The Services are used for the Excel User Interface, e.g. RSF, SH. To remove a previously saved connection, select the connection in the Name pull-down menu and click Remove Connection. The SFC configuration file contains various settings for the RMDS SSL and TIB infrastructures. Vistasource provides a sample configuration file in the installation directory called sfcapi.conf. Depending on your configuration, you may need to merge this sfcapi.conf file with an already existing file on your system. A few of the parameters are highlighted in this section. For further information regarding all the parameters available, see the Reuters SFC Documentation. The SFC API will look for the SFC Configuration file in the following locations. By default, the data dictionaries are downloaded from the network. However, the files can also be located on your machine. SFC logging can be controlled using several parameters. If you need to debug and turn on logging, several logging severity levels are available. The list is from lowest to highest: Debug, Info, Notice, Warning, Error, Critical, Alert, Emergency. Events are logged at the specified severity level AND HIGHER. For instance, if Info is specified, all events except Debug are logged. The default is Info. Tracing provides a way to log extra debug messages. The specified value is an integer bitmask of various levels. In other words, valid values can be created by adding the desired levels. The default is 0, i.e. no tracing. Tracing only works when the *selector configuration is set to Debug. This section contains several examples for basic SFC setup. 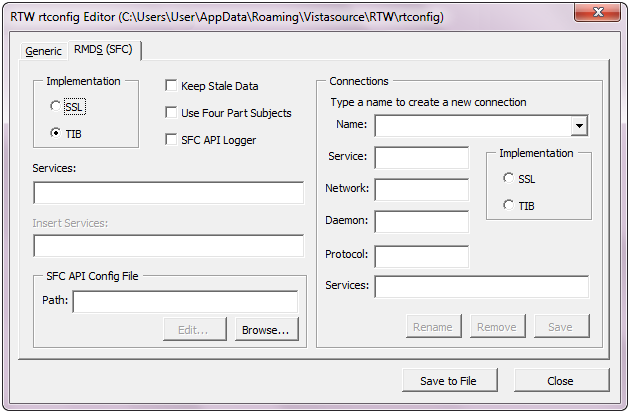 In Excel, select Vistasource → Settings → Rtconfig Editor to launch the rtconfig editor. Select the RMDS (SFC) tab. Verify the directory C:\var\triarch exists. In Windows 7, browse to C:\Program Files(86)\Vistasource\RTW\4.5\ and in Windows XP, browse to C:\Program Files\Vistasource\RTW\4.5\. Copy the files appendix_a and enumtype.def. Paste the files into C:\var\triarch. Enter a comma-separated list of services in the Service field. The service list will vary depending on your Reuters installation, e.g. RSF,IDN_RDF. Browse to the SFC API Config file. Vistasource provides a sample file called sfcapi.conf in the installation directory. Select this file (you will edit it in the next step). While in the Rtconfig Editor, click the Edit button next to SFC API Config to edit the sfcapi.conf file. Enter your values for protocol, service, network and daemon according to the values collected before getting started. Additionally, the entitlements settings may require changes depending on your setup. Entitlements are on by default. If you do not have access to the DACS permissioning system, set this value to FALSE by uncommenting the *enableEntitlements: FALSE line. In Windows 7, browse to C:\Program Files(86)\Vistasource\RTW\4.5\ and copy the files appendix_a and enumtype.def. In Windows XP, browse to C:\Program Files\Vistasource\RTW\4.5\ and copy the files appendix_a and enumtype.def. Setting up both connections via the Connection panel on the right side (see Example 2 below). Enter the Rendezvous daemon, i.e. tcp:10.100.1.92:7500. Enter the protocol, e.g. SASS2 or SASS3. Enter the services. The Services are used for the Excel User Interface, e.g. RSF, SH. Click Save to File to save your selections in the rtconfig file and close the RTW rtconfig Editor. Remove any rmds_Implementation and rmds_Service settings. In Windows 7, browse to C:\Program Files(86)\Vistasource\RTW\4.5\rtconfig and in Windwos XP, browse to C:\Program Files\Vistasource\RTW\4.5\rtconfig. Open file in a text editor. Scroll to rmds_Implementation and rmds_Services in the section “vsRMDS RT Engine Settings” and verify that both parameters are commented out. If you made changes, save the file and close. Save the connection by clicking Save to File. Save the new connection by clicking Save to File.